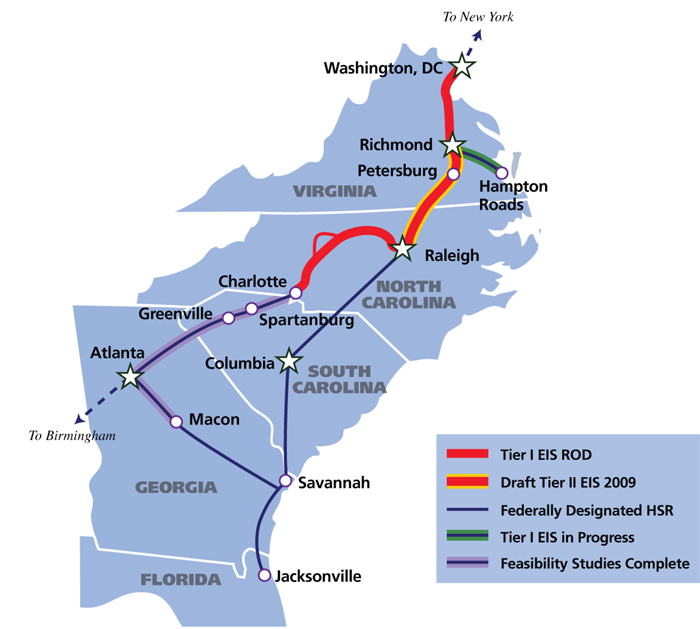 The proposed Southeast High Speed Rail Corridor (SEHSR) planned to run from Washington DC to Charlotte, NC via Richmond and Petersburg, Virginia. This corridor is a candidate for a rail-with-trail. Let's hope officials realize that we could not only upgrade our rail infrastructure but create a complete, multi-modal transportation corridor (Complete Corridors) at the same time. The SEHSR could be the example for the rest of America of how we should prospose and build transportation corridors for the twenty-first century. Let's not squander this incredible opportunity. Our children and grandchildren will thank us.